SOLO WITHOUT ROPE DRAG Eliminate rope drag when soloing by wearing one of our JET or STEALTH PACKS to carry your rope, water, and rack your gear. Rather than having to pull up the weight of the rope (plus drag) take it with you! Tie a big knot in the end of your rope (and every 15-20 ft) then flake loosely in the pack. As you climb up, the rope is pulled out of the pack, over your shoulder and down through your SOLOIST, SOLO AID or SILENT PARTNER. Enjoy the extra freedom & confidence that the slack end of your rope can't get hung up - on anything! 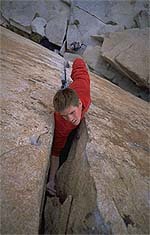 5.11c - just imagine - a Four Star off-width...woo hoo! Mark your gear with these durable die cut, color coded RACK TAGS.